60% easier stapling, you can easily staple up to 40 sheets by using one finger. Elegant colors and compatible with various types of staple (including 24/6, 24/8, 26/6, 26/8) to meet your different need. A dual-function anvil that can bend legs inward or outward can used for temporary or long term stapling. Lightly press quick-load button and the load tray will popped up for you to check and re road（Max. 100pcs). 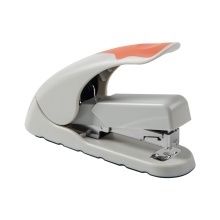 Soft and ergonomic grip material ensures comfort while stapling.